of feuding, he could not hold off that fatal blow. Some interesting stuff is going on in this passage. First, there’s the question of who killed Ongenþēow. The text suggests that it was Hygelac who killed him “by the sword’s edge” (“billes ecgum” l.2485), but it also mentions an Eofor who is credited with splitting his helmet (“thǣr Ongenþēow Eofores nīosað;/gūð-helm tōglād” ll.2486-7). So who’s the real hero, Beowulf? To a modern reader this double crediting of Ongenþēow’s kill (something that might lead to another killing if it happened in a MMORPG), might seem confused. But, to an Anglo-Saxon sensibility, it makes perfect sense. Consider for a minute the fact that Hygelac is, at the point when Ongenþēow’s killed, the leader of the Geat forces against the Swedes at this battle since Hæðcyn has been killed. Thus, Eofor is fighting as Hygelac’s thane – Eofor is part of Hygelac’s group. In Anglo-Saxon terms, such a group could be called a “comitatus,” a band of warriors held together by mutual quid pro quo. If a warrior pledges his life and sword to a lord, he fights until his death – even if that lord should die before he does. In return, the lord provides the warrior with treasure and land. “The Battle of Maldon” is a perfect example of the comitatus style of loyalty because it tells of a band of warriors that fights on after their lord dies, even though they all know that they are doomed to die. What’s happening in Beowulf, then, is that Hygelac is being credited with Eofor’s kill because Hygelac is the head of the Geats, of the Geatish comitatus, and likewise, all of the warriors within Hygelac’s comitatus are his swords. So it’s fair to say that Hygelac had his vengeance on Ongenþeow by the edge of the sword, in the sense that he was killed by one of Hygelac’s men. At the level of words within the passage, there are indeed a few that are quite curious. Unfortunately, the literal translation doesn’t work quite so well, since “sword-pale” suggests that something is as pale as a sword. Depending on what it’s made of, a corpse might get to a similar pallor as a clean, shiny sword, but it’s a rather fantastical comparison. “Mortal wound” is a little on the nose, though, so “sword-wan” is what was used above. The term is used in the senses that Ongenþēow is weakened by the sword, and about as strong as a sword without a wielder. He is mighty, yet useless, as he lay where Eofor split his helmet. Moving into Beowulf’s boast about his own accomplishments yields more tricky and wondrous words. First up there’s “ēðel-wynn” meaning “joy of ownership,” but made up of “ēðel” (native land, country, home) and “wynn” (joy). So translating the term as “joy of ownership” does work, in that there will be a joy in a native owning their own land, but at the same time “joy of ownership” falls short by generalizing the original word too much. Nonetheless, what’s telling about the translation is that it completely ignores the fact that “ēðel-wynn” contains a specific reference to land (“ēðel”). There might not be an exact and precise equivalent term in English, but by cutting out any reference to land, it seems like that there’s a desire to deny a sense of landed-ness in Anglo-Saxon at play. The fact that a compound word with “ēðel” is used here is important because it shows that whenever Beowulf was written (or maybe even when it was still being sung) land ownership was a big deal to Anglo-Saxons. This means that they might have had a sense of nationhood as we do today, since it wasn’t something nebulous or abstract. Words like “ēðel-wynn” allow you to make a case that there was a sense among Anglo-Saxons that a place defined a people and that if a certain people was given a certain space then that people would be joyous. So, it seems that Seamus Heaney’s translation of the word as “the security that land brings” is better, though still wanting for the implied sense of nationhood. Heaney’s translation might just be in a newer dictionary, or it could be derived from the idea that “Gifðum” is a corruption of “giefu-hus.” A stretch, maybe, but the poem Beowulf isn’t beyond having a few textual ticks here and there. For example, in the original Anglo-Saxon, there’s a consistent difference in spelling between the first and second halves of the poem, suggesting that there were two scribes involved in making the copy of the poem that we still have today. Of course, textual ticks or no, that still leaves the nature of “Gifðum” a mystery. If you’ve got your own theory about what “Gifðum” could mean, I want to know, just leave it in a comment for me. 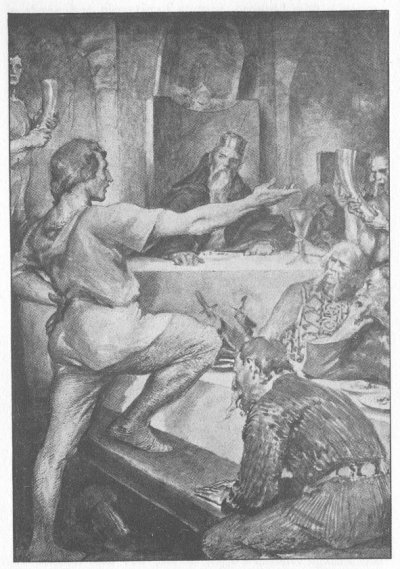 Next week, St. Isidore talks of the goat, we get some more medieval lore, and Beowulf starts into more boasting. Don’t miss it! This entry was posted in Beowulf, poetry, translation and tagged Anglo-Saxon, boasting, Clark and Meritt, comitatus, Old English, Seamus Heaney by NSCZach. Bookmark the permalink.